Let’s face it; fire is something we humans have been gathering around for ages. It’s warmth, and bright snaps of flame and loud crackles is what makes it easy for us to gather around for what seems like hours. But, how do you create that far-off woodsy-wonderland camp, or deliver the comfort of nestling by the living room fireplace? Let’s talk tips for understanding a fire pit or fireplace build in your backyard design, and how to create a hardscape environment that keeps everyone returning. In theory, a hardscape is the best way to extend the use of your pool, creating a truly inviting gathering space for your friends and family. Whether this means by deck, patio, or pavilion is entirely up to you however, a fire pit or fireplace can be part of an overall pool structure to create a pleasing aesthetic. Unless you’re waking from a coma, or reading this from a warmer demographic void of fire pits, then you understand how popular these backyard gathering spots have become. Burning either wood or gas, fire pits can be created with a variety of elements including, but not limited to: decorative flagstone, pavers, or brick, and finally, glass and decorative rock as a welcomed addition of color and mystique. 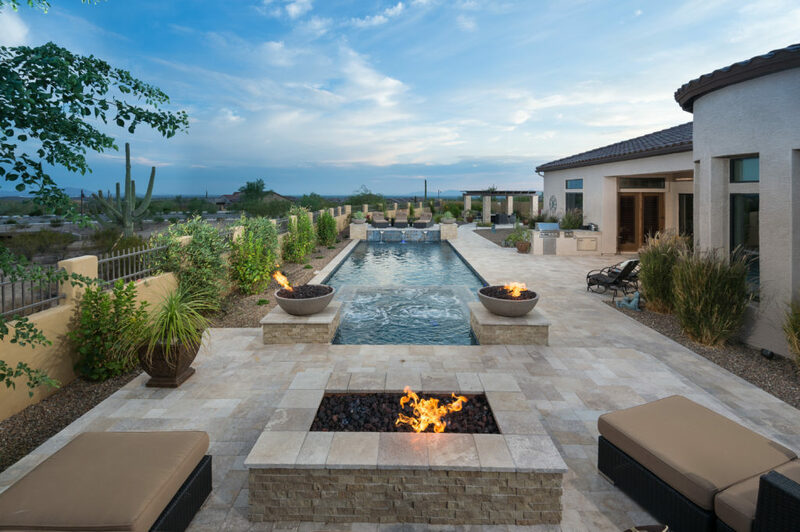 It doesn’t matter the time of year (Unless it’s Summer in Arizona), anytime is a great time to enjoy company around the fire, and a fire pit is both aesthetically and sustainably welcoming when paired with an arrangement of other backyard elements. 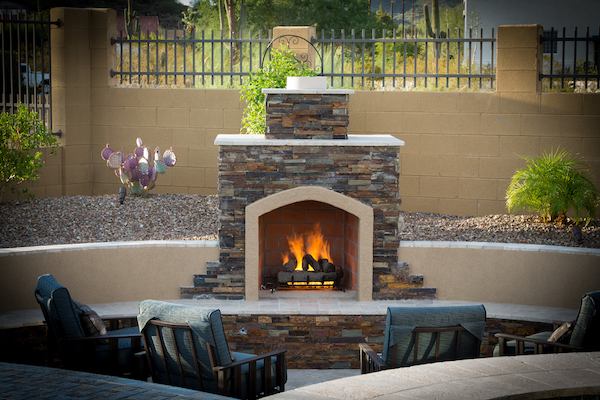 Bring the atmosphere and intimacy of an indoor gathering by adding a fireplace to your backyard setting. Like the fire pit, a fireplace creates an outdoor living room, extending your entertaining capabilities to a seasonal operation. Building materials vary however, stone remains an exciting element for helping a fireplace stand out from the rest of your design. Paired with a seating element, a fireplace adds romance to your pool and patio, and don’t fret: there are both wood and gas burning options. Another popular option that pairs well with many kitchens are fireplaces, or wood-burning stoves which, we’ve covered here. (Insert Link: Backyard Designs: Outdoor Kitchens). Where is this link? What’s Best For My Backyard Design? Every backyard design is unique; are we working around an outdoor kitchen, or building up against a structured wall? How will the fire work around a pool or spa? How will we accommodate all of my family and friends while staying within our budget? When it boils down to it, you have to ask yourself the setting you’re attempting to create and the functionality of said space. Beyond choosing between fire pit or fireplace, the process of placing a hardscape relies heavily on your aspirations for the space as a whole. We welcome everyone to visit our design centers, meet our team of designers to learn about the process of adding a hardscape to your backyard setting, and explore options for making your space a fiery-success.